More than 10 applications arrived for the Younger Age Category European Championships and for the EHF EURO Events in the 2012-14 period. The bidding documents for the 2014 EHF EURO Events as well as those for the YAC Events in 2012 and 2013 have arrived at the EHF office. After letters of intent submitted by the interested nations in the spring of 2009, the nations named below have presented a valid bid before the deadline for the events of the 2012-2014 period. *No bid arrived from valid candidates out of the interested nations; Switzerland submitted a bid for the 2013 W17 European Championship, but had not registered in spring 2009. **Croatia and Hungary presented a joint bid. An intensive evaluation process will commence now. This procedure will involved the finalisation of details, venue inspections and an evaluation of the event concepts presented by the bidders. The following steps will be taken before September 2010 when the decisions on the European Championship organising countries will be finally taken. 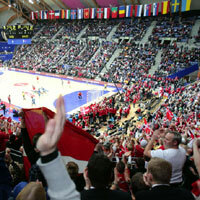 * The EHF EXEC has tabled a motion for the 2009 EO Congress regarding a change in the allocation mode of the EURO Events.